An individual without direction is like Alice in the fairy tale Alice in Wonderland. In a conversation between her and the Cheshire Cat, Alice asked, "Would you tell me please, which way I ought to go from here?" "That depends a good deal on where you want to get to," said the cat. "I don't much care where," said Alice. "Then it doesn't matter which way you go," said the cat. 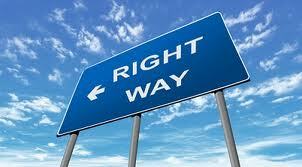 Many have been trying to search diligently and seeking patiently the right direction for their life. There is an intense desire to having an better-quality life as days and years pass by yet the “how” still seems unknown to many. How does one know if you are traversing in the right direction? Is being married with this person the right choice? Is this course the right way? These are all valid questions that need valid answers. There are those who trust their instincts in regards to making choices. Yet many is stuck and surrendered to whatever comes their way. Though, there is a bit discomfort at first but for lack of a better option, they’ve just decided to just give in. Both of these actions are extremes that need to be evaluated and applied on a case-to-case basis. Also, because of the many choices presented to us, conflict within us arises. Thus, we become unstable and double-minded especially true when we allow other people to give opinions, the choice becomes even more difficult. Remember that every situation we are in will contribute or confuse any right decision made. Looking at this example, observe that God did not tell him where he will go but only mentioned that He will show the way towards it. Then the promises of blessing were added to emphasize God’s intentions. There was a specific direction from point A to point B yet no mention to what will happen along the way was missing. Abraham’s response was critical to the fulfillment of God’s plan and he needed to have faith in God’s plan. Unreserved faith in God’s promises kicks in a high gear for those who trust God’s way unquestionably. God has a clear direction towards the way we need to go and a guaranteed result when we completely obey resolutely. Unfortunately, this is where many are stumped at the idea of putting everything in God’s hands. They shudder at the thought of not knowing the specific details of any venture. This is due to the fact that we were taught not to do it this way. Furthermore, when we let go of something, we think that everything must go our way or no way. Besides, one might say, “Trusting other than my own instinct even God Himself is a red flag and a “no-no”. Well, it is a choice that each one must make. We could continue to do what we think is and receive unsatisfactory results as a hit and miss style or through God’s way that is already proven as tried, tested and true. Remember that with God, it is always a sure thing! We know that God fulfilled His promise to Abraham because even after more than 4,000 years, Abraham is still a very important figure to three major religions in the world: Judaism, Christianity and Islam. What more do you need to be assured that God knows what He is doing?